The personal information of Marriot Hotel group customers has been hacked. This started in 2014 and has only just been found out. It may affect up to 500 million people. The company do not yet know the exact number but they have started to email all those thought to have been affected. Marriot is providing all US, Canadian and British customers with free use of the WebWatcher internet security service which can monitor your Internet devices. The data stolen includes name, address, phone number, email address, passport number, date of birth, hotel stay information and possibly more. It also includes financial information for some customers. This is an extremely serious data breach and may lead to financial theft and identity theft. Law enforcement agencies are investigating what happened but it may time for the picture to become clear. Many hackers use a long slow approach to siphoning out data from a company and it can very difficult to determine exactly what they took. 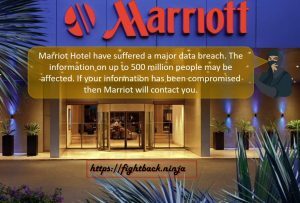 If your data has been stolen then you will be contacted by Marriot. However, scammers will also send out fake messages claiming to from Marriot about the data breach so if you have been a Marriot customer since 2014 then be careful with any messages or calls you receive. If you have had any problems with your data being compromised – do let me know by email.